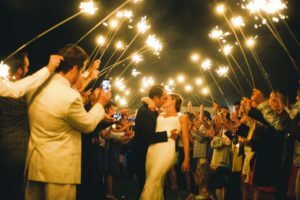 The most popular months for weddings are June, August, September and October – the months when weather is at its best and outdoor venues are stunning. And although it’s beautiful year-round, there’s something extraordinary about northern Michigan’s picturesque coastline that makes for an unparalleled backdrop during these months. 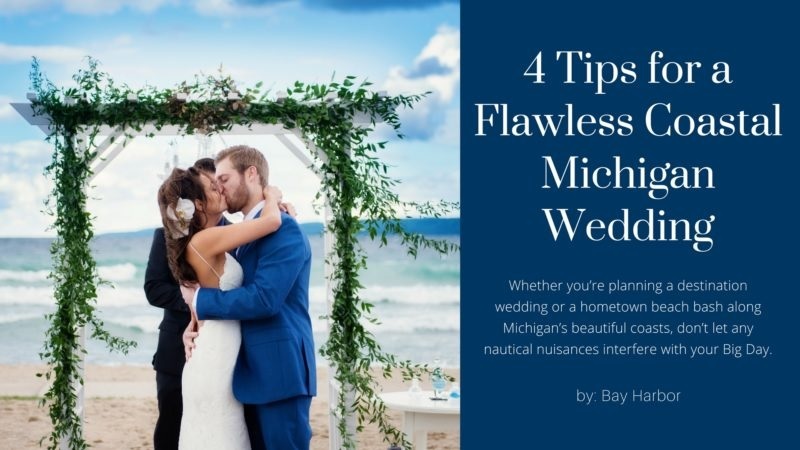 If you’re considering taking advantage of Michigan’s world class shore at your wedding, these four tips will assure your beachside bash in unforgettable! Choosing the right spot is the most important start to a great lakeside wedding. 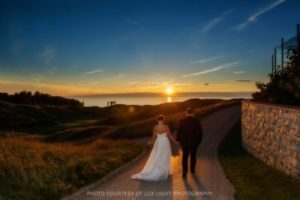 There are countless breathtaking backdrops along the freshwater coastlines of Michigan, but when choosing your location there are many things you should take into consideration in addition to the backdrop: Can guests get there easily? Will it be noisy or windy? Are there bathrooms and parking nearby? Are there lodging accommodations? Is there a backup location available in case weather does not cooperate? We’re listed #1 on “10 Can’t-Miss Waterfront Venues in Michigan” by theknot.com. Click here to see! Bay Harbor’s Sunset Beach provides the ultimate fairytale settings with magnificent views of bright waters and pristine Lake Michigan shoreline. With bonfires, volleyball, and the waves as your play list, Sunset Beach is a great spot for your rehearsal dinner, welcome party or reception. Bay Harbor can accommodate a relaxed beach cook-out or elegant plated meal for up to 300 guests. For a truly nuptial occasion, there is nothing more scenic than the Observation Platform. Surrounded by Lake Michigan’s deep blue waters, panoramic views of sailboats and yachts in the distance, and the sounds of waves, this breathtaking venue is unique to Bay Harbor and accommodates up to 200 guests. 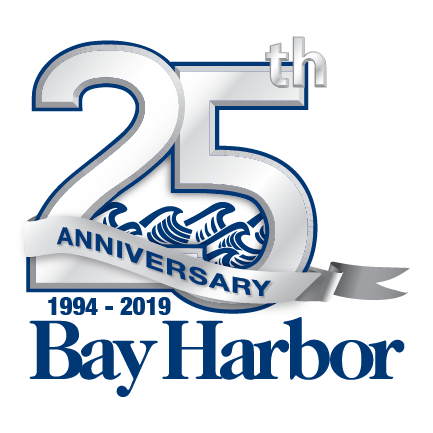 The Marina Lawn Panel at Bay Harbor is the perfect host for your grand nautical celebration. You and your guests will experience an unforgettable evening with cocktails, dining and dancing just steps from the Bay Harbor Lake Marina and with views of magnificent homes and yachts in and around the lake. This maritime venue holds up to 300 guests. The timing of your ceremony can be crucial to keeping your guests comfortable. Summer heat along the water can be brutal in the early afternoon – you don’t want cranky and sweaty people on your hands! Check the weather as the date gets closer and be prepared for varying temps, rain and sunshine after all, Michigan doesn’t have the most predictable weather trends. If it looks like it’s going to be hot, consider providing your guests with fans and cold water. Put together a list of must have photos when planning your big day. For example, if you know you want sunset beach photos, you’ll want to schedule your ceremony and reception around the sunset time. You’ll want to take your top-priority photos when your make-up and dress are still looking fresh, too. We know the last thing you want to do is scrap your picture-perfect day in the sun, but sometimes Mother Nature just doesn’t cooperate. Renting a tent is always a good backup, but making arrangements for an indoor event space is an even safer bet. Take advantage of the “Pure Michigan” beauty in your surroundings. Hang your signage in the trees or stick them in the sand. Line the aisle with shells or driftwood from the beach. Using the environment for elements in your wedding gives a natural feel, and it’s inexpensive! If you and your guests are going to be on the beach, embrace the sand between your toes with proper footwear (or lack of footwear), and inform your guests of the setting so they wear the proper attire too. Find more information on all of our wedding venues HERE.